Professor Jorge Nocedal discusses optimization and machine learning at the ACNTW Workshop held at Northwestern. Argonne National Laboratory's Prasanna Balaprakash presents at the ACNTW Workshop at Northwestern on May 18. Jorge Nocedal isn’t one for complacency and urged his fellow researchers to challenge the status quo, as well. The final of eight presentations at the ACNTW Workshop at Northwestern on May 18, a biennial gathering of researchers in optimization and machine learning, Nocedal explained the primary challenges facing optimization methods for large-scale machine learning problems while championing algorithm design featuring both strong generalization properties and the ability to parallelize. “Us optimizers can’t be satisfied that stochastic gradient descent [the workhorse algorithm used in machine learning today] is the final solution,” Nocedal concluded before an audience of some 150 university researchers, scientists, PhD students and post-docs at Northwestern’s Wieboldt Hall in downtown Chicago. 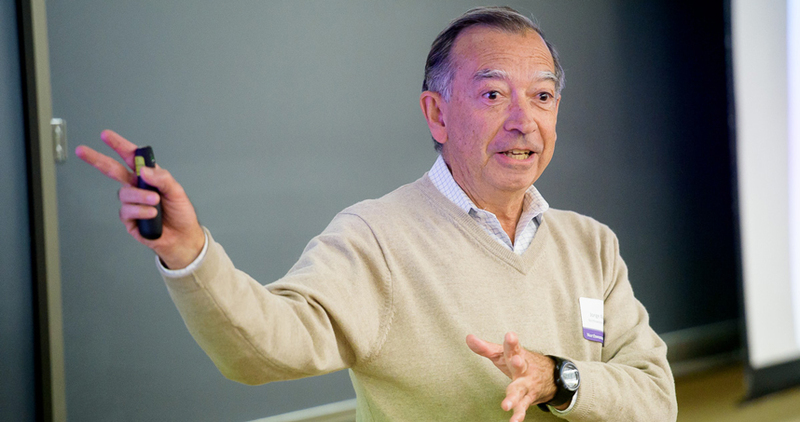 Nocedal, the David A. and Karen Richards Sachs Professor of Industrial Engineering and Management Sciences at Northwestern’s McCormick School of Engineering, and his presentation characterized the ACNTW Workshop’s ambitious aims and innovative vibe. Hosted by Northwestern’s Center for Optimization and Statistical Learning, the workshop assembled computer scientists, statisticians, and optimization researchers from five institutions – Argonne National Laboratory, the University of Chicago, Northwestern, the Toyota Technological Institute at Chicago and the University of Wisconsin (ACNTW) – to share and discuss pioneering research in machine learning. “The workshop is really an opportunity to learn how optimization is transforming machine learning and high-dimensional statistics,” said the event’s Northwestern lead David Morton, professor of industrial engineering and management sciences and director of the Center for Optimization and Statistical Learning. Nocedal and Aravindan Vijayaraghavan, assistant professor of electrical engineering and computer science, were the two Northwestern faculty members pegged to present their research at the workshop. Vijayaraghavan’s morning program focused on the design of robust efficient algorithms for learning probabilistic models for community detection, even in the presence of adversarial modeling errors. Other researchers presented the latest findings related to a range of relevant issues across the machine-learning landscape, including superadaptive optimization, the design of scalable algorithms, non-metric multidimensional scaling, and automatic data-driven modeling. Morton said such discussions and idea-sharing have the potential to fuel next-generation applications in areas such as cybersecurity, image processing, recommender systems, and a wide array of other everyday machine learning functions. “Where do we stand in terms of cutting-edge methods for solving problems in machine learning using optimization? That’s what this event investigates and where we’re all looking to push the boundaries,” Morton said. Abhratanu Dutta, a second-year PhD student at Northwestern who largely works in theory, relished the opportunity to learn about the latest science related to machine learning’s more practical implications. “Machine learning is such a popular topic right now, and researchers are coming at it from all different angles, so it’s exciting to see how researchers are approaching various issues and working together to solve problems,” Dutta said. The daylong event, which further solidified Northwestern’s leading role in optimization and machine learning and its place as a convener of top minds in the field, concluded with a 90-minute poster session featuring 25 posters from PhD students, including 13 from current Northwestern PhD candidates. Posters covered topics in optimization and machine learning ranging from tomographic imaging and alternating minimization algorithms to the expected improvement algorithm and mitigating cyber risks in the supply chain. “The poster session offers young researchers a wonderful opportunity to present their work, get feedback on their research from leaders in the field, and explore the next questions that might guide their research,” Morton said.